I already reviewed several books on this blog, but these have all been larp-specific rulebooks. This is the first time I'm posting a review for a novel. 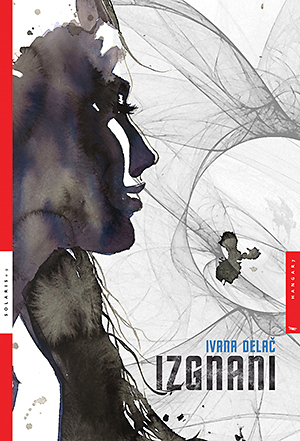 Having said that, Izgnani ("Exiled") by Ivana Delač is not just any novel - it's a first Croatian novel based on a larp - which I ran. It's hard to convey how honored I feel because of that. It's the first time something like that has been done in Croatia, and reading a novel based in the Izgon setting which I wrote, with characters I created and many of my friends played - it was a warm, incredible feeling reading Ivana's novelization of the larp and setting. This is why it's hard for me to review Izgnani purely as a novel - for me, it's also a novelization of the larp I ran, an unique take of the setting and introspective into larp design. However, it does work very well as a novel. As a quick refresher if you don't know the backstory - the plot is urban fantasy, it focuses on energy beings who arrived on Earth, and possessed human host bodies, trying to get back home. It's marketed as a young adult novel, and apart from all the fantastic elements it features a lesbian relationship - yet another first for that genre in Croatia, AFAIK. Some stuff from the larp was condensed, changed, omitted and/or simplified in order to work better in the novel format, and provide for a stronger plot. The main plot was shortened from over a month to one week. This also means several characters in the novel do things they didn't (or wouldn't) in the larp - but this is OK from the point of setting continuity, as alternate realities are a thing in the setting. Some of these elements can be seen later in the novel, as although it was primarily based on the events of first Izgon larp, it also includes several elements from Izgon 2 and Izgon 1.1. The story as presented makes for a stronger novel than pure novelization of larp would, and presents a few plot twists and surprises even to the players of the larp - comparing it to the original character diary (in Croatian) is quite interesting, and while the diary is a brilliant work itself, the novel presents a plot which works much better as a novel, and provides for a lot more explanations to someone new to the setting and less familiar with the characters involved. As the organizer of Izgon, it made me rethink a few things about how these larps were organized. About how some of that stuff was actually personal to the players involved. Taking a wider outlook on the things often misses important personal details. Also, reading about the character which I role-played during the larp made me feel all warm and fuzzy on the inside.